Ever since you were young, you had always dreamed of recording in a studio and today your dream is coming true: you won a 4 hour recording session from a local record label! As you clutch your guitar and walk through the doors, you notice the chic industrial decor of the recording studio. With exposed ceiling beams and piping, and graphite colored walls, you are definitely impressed. But what impresses you most of all is the Sierra Rustic Versailles pattern travertine mosaic tile. The cream and grey base of the tile is accented with rust and mocha colored clouds, brightening the room with every square foot. You look up and realize that you're standing at the entrance of the recording room; you look down at the Sierra Rustic Versailles pattern travertine, smile and walk in ready to take on the world. 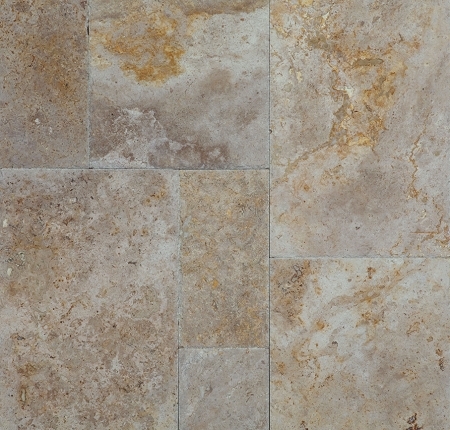 Sierra Rustic, Chisled, Versailles Pattern travertine is perfect for floors and walls in any indoor and outdoor area. It is also wonderful for kitchen backsplashes and shower / bathroom walls.